Hugh Moss Limited, Chinese Snuff Bottles, Summer 1976, p. 64, no. 175. JICSBS, Autumn 1982, p. 42. Magpies (xique) represent happy events, and can also evoke another expression, xibao chunxian ("The magpie announces the arrival of spring"). Thirty magpies also illustrate a popular tale related to snuff bottles which is narrated in Yonglu Xianjie, Zhao Zhiqian's late-nineteenth century book on snuff and snuff bottles, where a man was tricked into paying a fortune for a porcelain bottle which seemed to depict each day of the month with a corresponding number of magpies, when in fact, the trickster had thirty bottles, each painted with a different number of birds, which he brought one by one in sequential order as if the bottles were one and the same. For a very similar bottle, formerly from the Wise collection and now in the Denis Low Collection, see More Treasures from the Sanctum of Enlightened Respect, p. 349, no. 314. 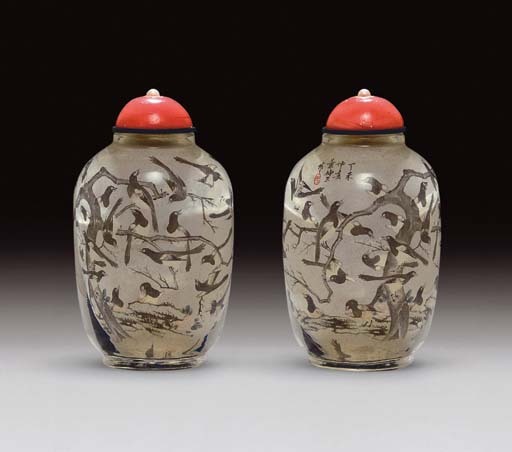 It would appear that Ye painted two or three wide-mouthed snuff bottles with magpies at Beijing in the spring of 1907.